All little girls love unicorns, rainbows and glitter, so what better gift for them than a unicorn toy? Unicorn toys and gifts have really risen in popularity over the last few years. There is so much choice, finding something your child will love can be somewhat difficult. Playing with unicorn toys is great for the imagination, and is a great way to help kids enjoy a fairy-tale dream. Unicorn-themed toys are perfect for adding a touch of magic to your child’s life, and are sure to be loved and treasured for a long time. Whether you decide to choose a plush toy or a figurine, you can guarantee your little girl will enjoy playing with it. There are numerous benefits attached to playing with a unicorn toy for kids. Such toys can be used to develop a sense of pretend play as well as helping improve the imagination. There are even toy unicorns aimed at young babies, to help develop their senses from a young age. Although they are merely a myth, unicorns are fascinating creatures to all youngsters, so read on to find our top picks of the best unicorn toys to surprise your child with on their next birthday. There is such a vast choice when it comes to unicorn toys. Whether you are looking for a small or large toy, a figurine, plush toy or even a talking unicorn pet, it is important to choose based on your child’s interests. That’s why we have included many different types of toy in our review here. With the numerous unicorn themed toys available on the market today, it is difficult to decide which will be special to your child. Let’s take a look at 21 of the best unicorn toys for kids, which will take away the stress of searching through hundreds of products to find the best. Offer this toy as a gift to kids aged four and above and you have certainly given them a friend for life. The FurReal StarLily plush pet toy is the best toy for kids to cuddle thanks to its soft and plush nature. The interactive toy responds to sound and touch, with over 100 combinations of sounds and motions. The unicorn can adopt different poses, either sitting, lying or standing, and also has a magical light-up horn. The interactive pet unicorn can flutter her beautiful wings, and will even dance when she hears music! This is the dream toy for kids who want their very own, real-life unicorn – it is the closest thing you can get! 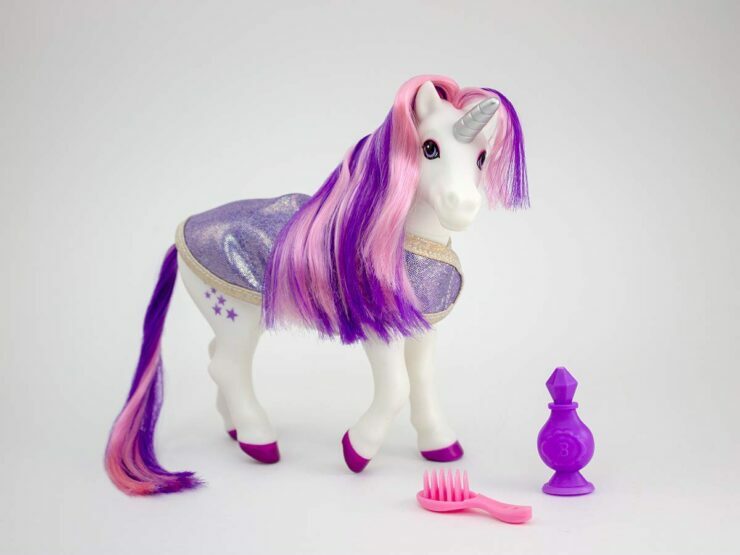 Kids will love brushing and styling their pet unicorn’s mane. Older kids will enjoy using the compatible app to play games and explore the forest where StarLily comes from! This dancing unicorn can play music to which she will dance along. The horn lights up in changing colors, a fun feature which is sure to delight young children. 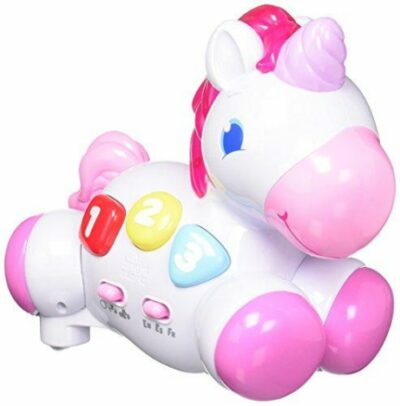 Kids will also love the cute unicorn sounds that this toy makes – patting the unicorn makes it give a nuzzling sound. The unicorn can be fed her own donut and also comes with a brush to make sure she always looks her best. This is a fun and educational toy – kids can use the 20+ included pieces to build and customize their very own pet unicorn! The pieces easily snap together, and can then be decorated with stickers. Kids can train their pet using a magnetic accessory or by clapping their hands. It can walk, play and jump, so it’s sure to provide endless entertainment. This STEM toy is perfect for teaching children over the age of five about robotics in a fun and relaxed way. The pieces can be used with other Build-a-Bot kits to mix and match and create whole new species! This unicorn ring holder is an excellent choice for girls who both love unicorns and enjoy wearing jewelry. It can be used to safely store small items such as rings and earrings, so you can always find what you are looking for. 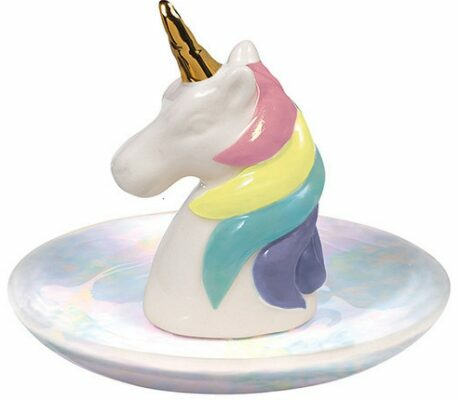 The colorful unicorn head makes this dish look great – any girl would love to have it on display in her room! Items can be placed around the base of the dish, and favorite rings can be held on the unicorns horn. Even if your daughter doesn’t wear jewelry, this would be a great piece to keep other small treasures or loose change safe. This plush unicorn toy is designed to repeat something that has been said in a funny voice. Thanks to its in-built high quality speakers, kids will be able to hear clearly whatever this pet is saying. It is easy to switch on and off, and is the perfect gift for children of all ages, even babies! In fact, even adults with a light-hearted sense of humor might appreciate this gift! The plush unicorn moves his head as you talk, which is a fun feature sure to delight young children. This is a great gift for Christmas – it is sure to keep the whole family entertained for hours! For kids who long to have their own, real unicorn, this offering from Melissa and Doug is an excellent choice. It has impressive shimmering fur and beautiful pink details. This unicorn will certainly appear magical to any young child! The wire frame used inside the soft toy ensures it stands up well, and also allows it to be placed into different poses. However, it is not designed to be ridden, only cuddled and stroked! Standing at an impressive 32 inches high and 45 inches long, this unicorn is perfect for young children who would love to have a life-sized unicorn! This cute toy is sure to appeal to young children who will love it’s sweet face and soft fur. The included bag is perfect for your child to take their new pet along everywhere they go. The high-quality materials give this toy a premium look and feel, so no matter how much your child wants to cuddle it, you can be sure it will last. 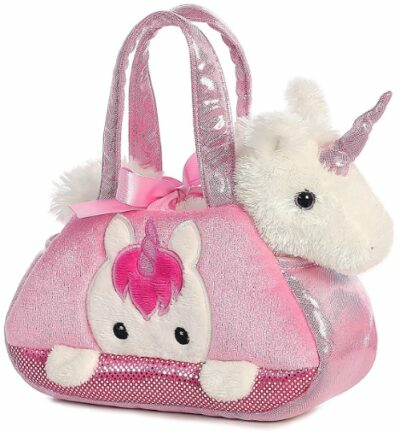 The bag the unicorn comes with is the perfect size for toddlers to carry around. They can even use it to put other treasures and important items in. The cute unicorn and ribbon detail on the bag is sure to delight them – they will love carrying their own bag around and showing it off to everyone! 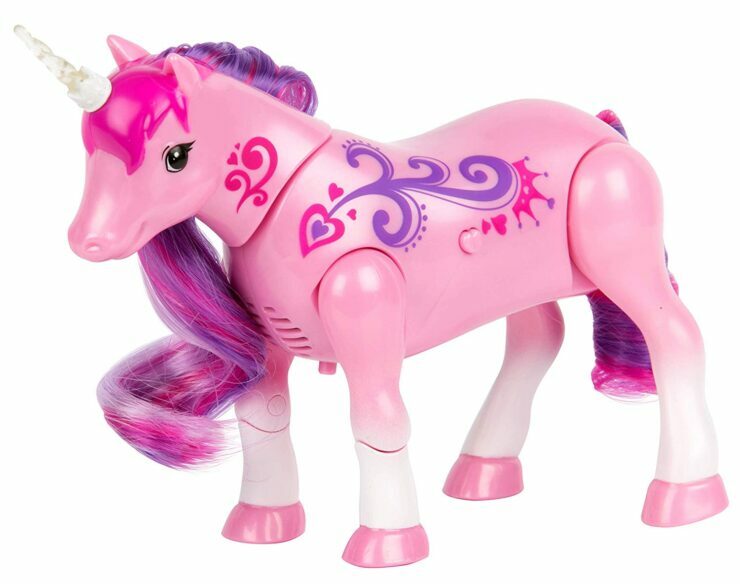 Durability is one of the main features of the Schleich unicorn figure, as it is made with strong and hard plastic. This ensures this toy lasts well and withstands the test of time. 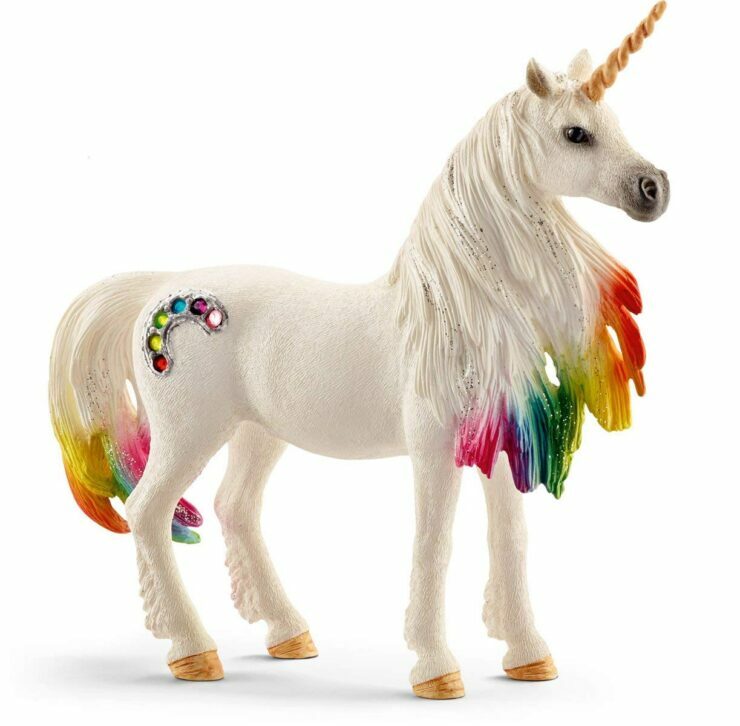 This unicorn toy will touch the heart of any child who plays with it – they will love the colorful mane and tail and the sparkly rainbow rhinestone detail. The figure is hand-painted so each one is somewhat unique. 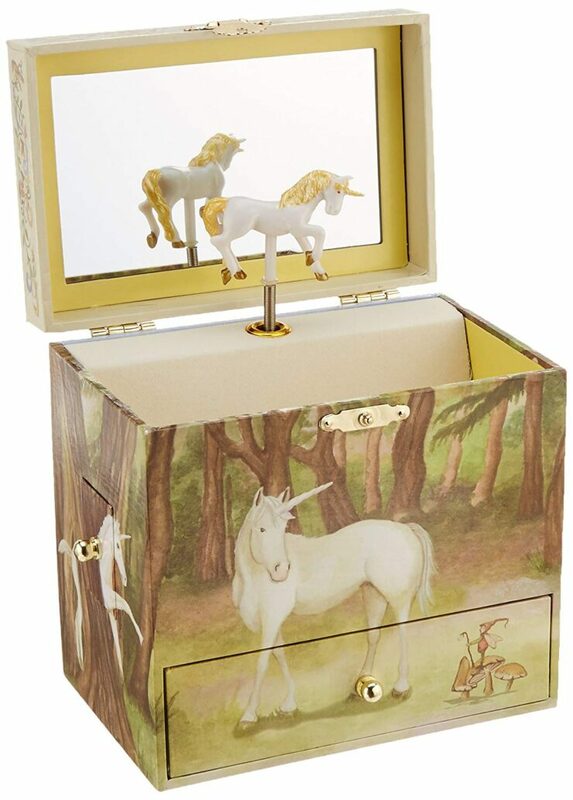 This is an attractive jewelry box with a unicorn figure in it which dances and twirls when the box is opened. It comes with a mirror which is perfect for applying makeup. The box is made from high-quality material so you can be sure it will last for many years. It comes with several useful features including side drawers and a large drawer at the bottom, which helps maximize storage space. At the press of a button, the VTech Go unicorn toy will start flapping her wings, moving her head and walking forward. It features fun phrases and even has the ability to light up which makes it really fun for young children. 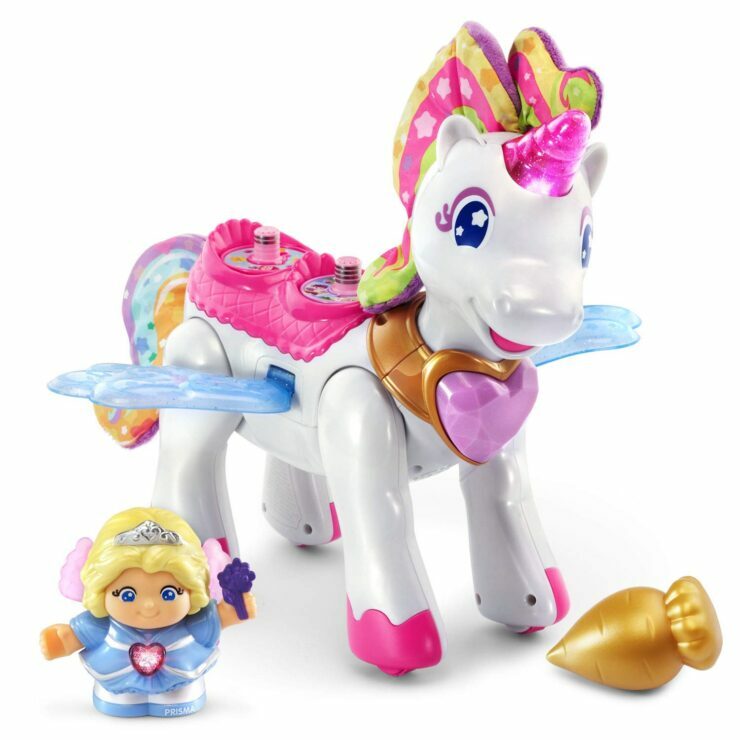 The Smart Friends VTech Go unicorn toy comes with a fairy figure who can ride the unicorn for more interactive fun. This toy is compatible with all other Go! Go! Smart Friends characters, which are available separate. So, this toy is great for starting a new collection. 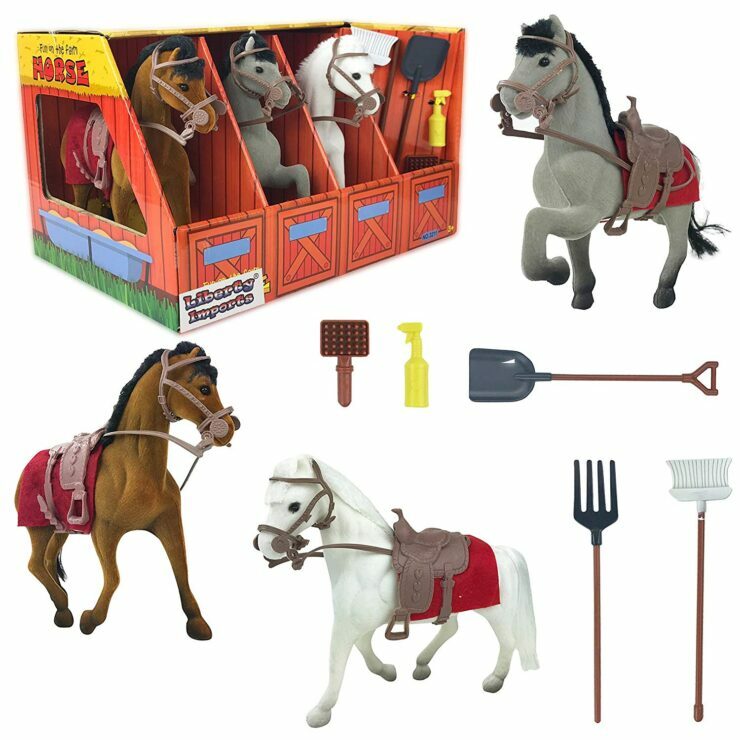 This toy horse set is a great gift for any young girl who loves horses. It is great for playing alongside friends or siblings, as there are three horses included. The toy is ideal for promoting imaginary play and offers hours of open-ended play and fun. There are many accessories included which makes this toy even more fun to play with. These include, saddles and bridles, a broom and shovel and a brush for taking care of the horses. These toy horses would be a wonderful gift for a young girl’s birthday or for Christmas, where they sure to be greatly appreciated. The set comes in two designs – horses or unicorns. The Breyer Luna color changing unicorn is a toy that kids can play with during bath time. It is a very exciting toy which is sure to make your child keen to go for a bath! Playing with this toy is easy – simply clean it using warm water then watch closely to see the markings, tail and mane change color. Upon drying, its color returns back to normal, making bath time magical! The unicorn toy comes with a spray bottle, brush and a bath robe. It is the ideal gift item for kids aged two and above. The Poopsie unicorn is one of the most wished-for toys this year, and one which is sure to delight kids aged around 5 years old and above. 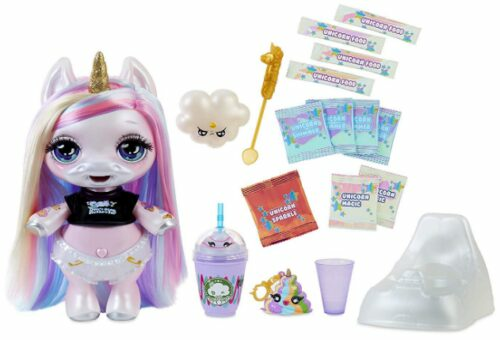 The unicorn is ‘fed’ using a variety of packets which come with the toy, then sit her on her glittery potty and watch as she poops out slime! The package also includes a poop character keychain which can be used to store the slime, as well as an exclusive bottle. There’s also a hair brush to keep your unicorn looking good, as well as a shirt and diaper for her to wear. Making the slime is easy, as there are full instructions, a cleaning tool and a measuring cup included. 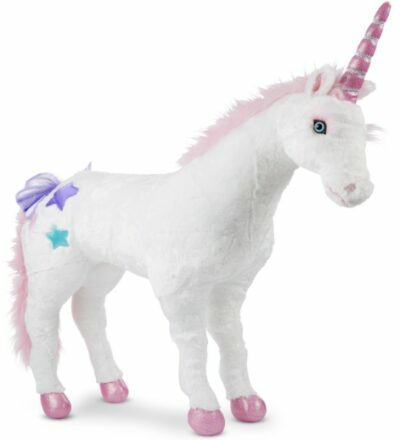 This plush unicorn is made from quality polyester fabric which is designed to last. So, you can be sure it will remain in good condition even if your child wants to take it around everywhere! Penelope the unicorn can even be machine washed on a gentle cycle and is also suitable for tumble drying on a low heat. 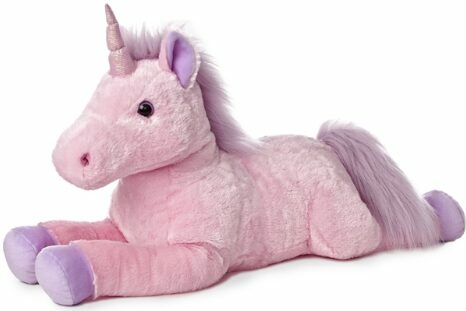 The unicorn plush features a lovely and soft pink mane and tail, as well as a shiny golden horn. 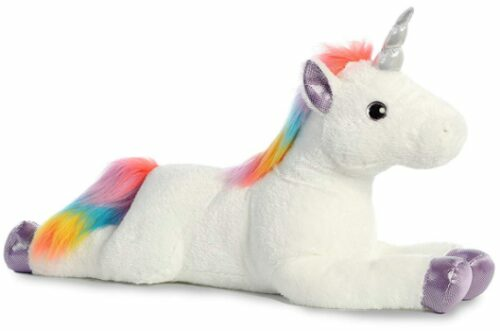 Kids will love cuddling up with this unicorn, which measures around 10 x 12 inches in the sitting position. One amazing feature of the WeWill glow unicorn toy is its easy to install LED light which lights up when turned on. It is the perfect gift for young children on any special occasion. The LED lights will go off automatically after thirty minutes of inactivity so as to help preserve battery life. This feature makes this toy ideal for young children who tend to go off and leave their toys after loosing interest. 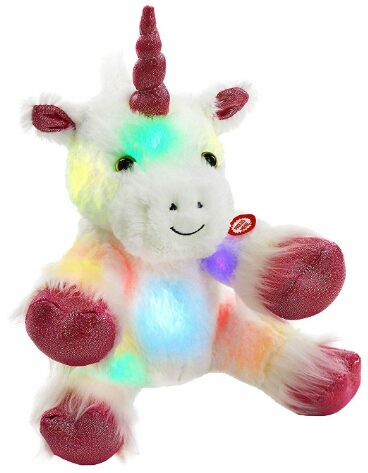 This unicorn toy is the best companion for both daytime and nighttime, as the glow can be soothing to kids who are afraid of the dark. Kids will love the satin star decorations, fluffy cotton material and of course the color-changing light. 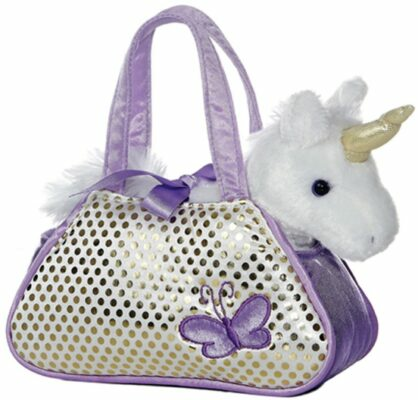 The Aurora Fancy Pals unicorn toy is made using an extremely soft material which kids will love to cuddle. The cute and colorful design is sure to appeal to little kids. This would make an excellent gift for toddlers and young children – they will love a new companion for both day and night. The toy is easy to carry around thanks to the carry handles on the bag – this is another reason why young children will love this toy. 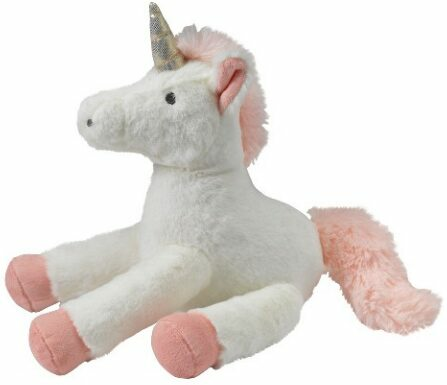 The aurora celestial plush unicorn toy is the best companion for kids as they can easily cuddle this toy whether they are relaxing on the sofa or lying in bed. It is made using high quality materials, which guarantees it stands the test of time. Safety is also guaranteed with this plush unicorn toy as it features a soft bean bag feeling which is double-bagged to prevent bursting. It is quite large at around 25 x 11 x 6 inches, which means it’s perfect for children of all ages! They will love cuddling their new unicorn and even lying on it as a pillow. If you want a toy that would help brighten your little kids day then the Jojo fingerlings light-up unicorn is the ideal choice. The Fingerlings unicorn is a cute interactive pet, which responds to sound, motion and touch. 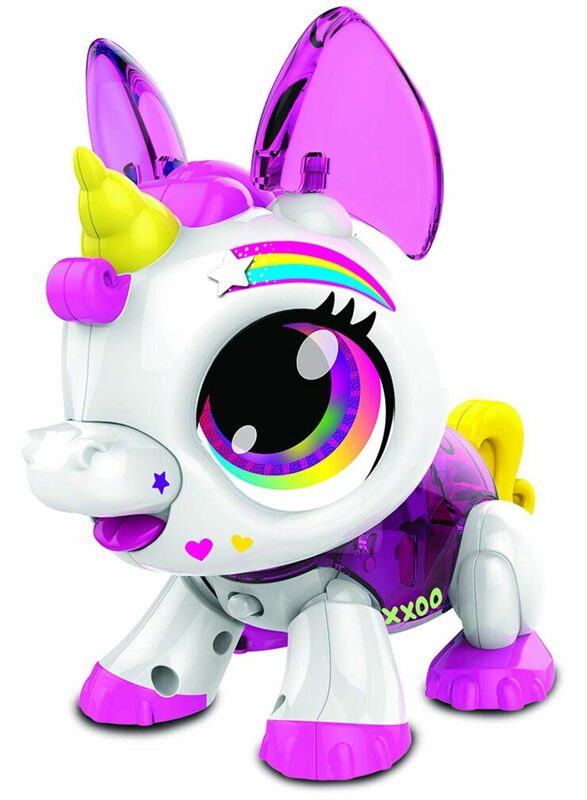 The horn changes color and the unicorn can also turn her head and blink her eyes. She also makes cute noises and gets excited if you make a loud noise. She can also go to sleep – it’s just like having a real little pet! Kids can even try holding the Fingerling upside down and watch how she reacts. 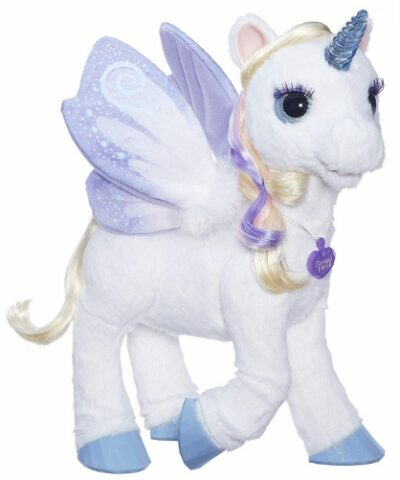 This is another top quality unicorn toy from Aurora, which is made using fine materials to ensure it is durable. The materials used in making this toy are also safe for young children. It also comes with lock washer eyes and a double bagged filling design to ensure maximum safety for young children. 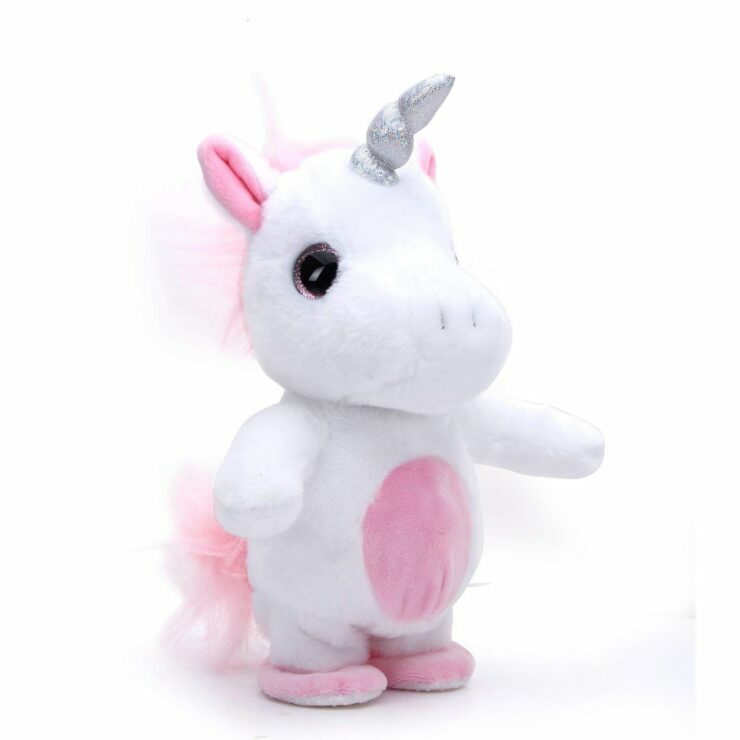 This unique unicorn toy has beautiful shimmery accents and a plush and cuddly feeling which makes it the ideal toy to hug and hold. This is must-have toy for babies and young toddlers, as it comes with a magical horn which, when touched, activates sounds and lights and makes the unicorn gallop. Not only is this toy loads of fun, it also helps kids grow and develop by teaching them about numbers, shapes and colors. Babies can crawl around and chase the unicorn, so it’s perfect for helping them practice moving around and keeping busy! Every time your baby catches the unicorn, it will change direction to ensure they are always entertained! One of the main benefits of choosing a unicorn toy for your child is the positive impact playing with such a toy can have on your child’s imagination. Kids are sure to feel happy and relaxed when playing with their new unicorn toy. Unicorn toys are ideal because they can be played with all the time – some can be used in the bath and plush ones can be used to cuddle up with at night. So, you can be sure you’ll get excellent value for money as your child will get loads of use from their new toy. We have selected a range of great unicorn toys, so you can be sure that whichever you decide to choose, your child will love it! No matter what the occasion or how much you are looking to spend, there is something to suit in our review here. Large plush unicorns are great for girls who are looking for a new companion to take around everywhere, and the smaller ones in bags are perfect for toddlers. For older kids, we highly recommend the Fingerlings unicorn or the Poopsie unicorn. They are sure to be delighted with the fun and interactive elements of these toys.